The type of work I do isn’t spontaneous and a lot of time and energy is spent trying to get into a situation where a photographic shoot can succeed and create images that can make a difference. I don’t often carry a camera but was during one weekend we spent in Blackpool. 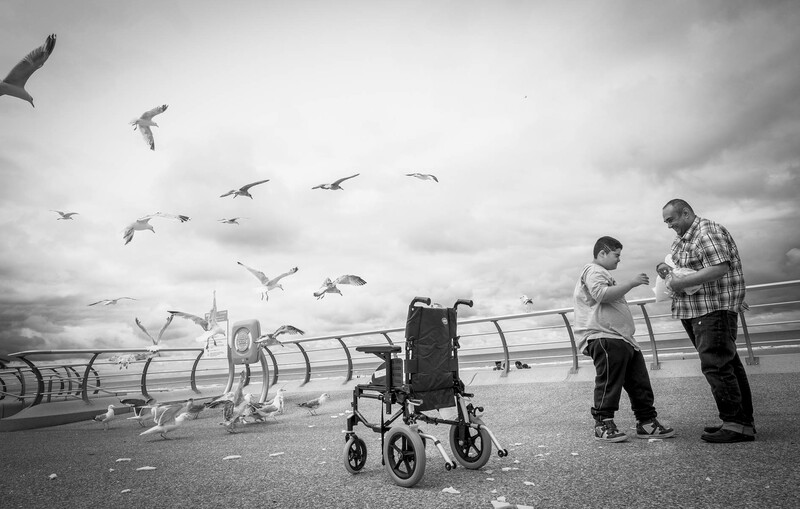 Walking on the sea front I saw Sam feeding the gulls with his father. I approached them and they were fine with my taking photographs. Unused to being the centre of attention they then asked me what I wanted them to do. ‘Just carry on doing what you were doing’ I said and they did just that. The resulting image here has it all going on and I’m very pleased with it. I gave them my card but sadly never heard from them – I would like to have shared this.